Mustangs Behind Bars: What did they do wrong? 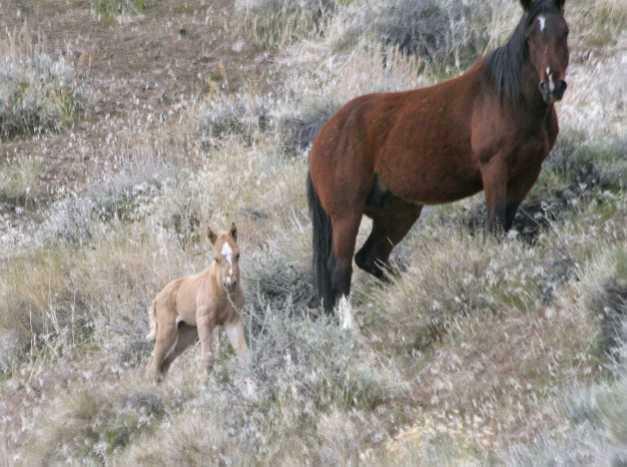 I don't know if the Calico Mountains foal, above, is the same young horse on the right. Both gaze through the bars of BLM's Palomino Valley facility. Why am I here? My life is out there. The capture and carnage must stop. 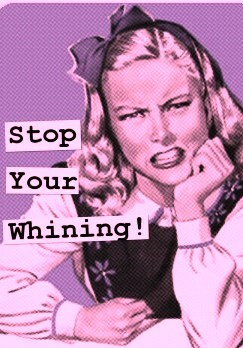 If you have time to whine, you have time to ACT ! Media outlets judge public interest in topics by the number of "clicks" the story gets. And if it gets written responses -- whoa, baby! -- it's a HOT topic and must be covered. LIVE TWEETING feels like a cross between fast-breaking journalism and haiku poetry. It allows me to cover the most disturbing stories with controlled emotions. Many of YOU were disturbed because you don't know how to Tweet and weren't following the slaughter sale of wild horses on Saturday August 17. 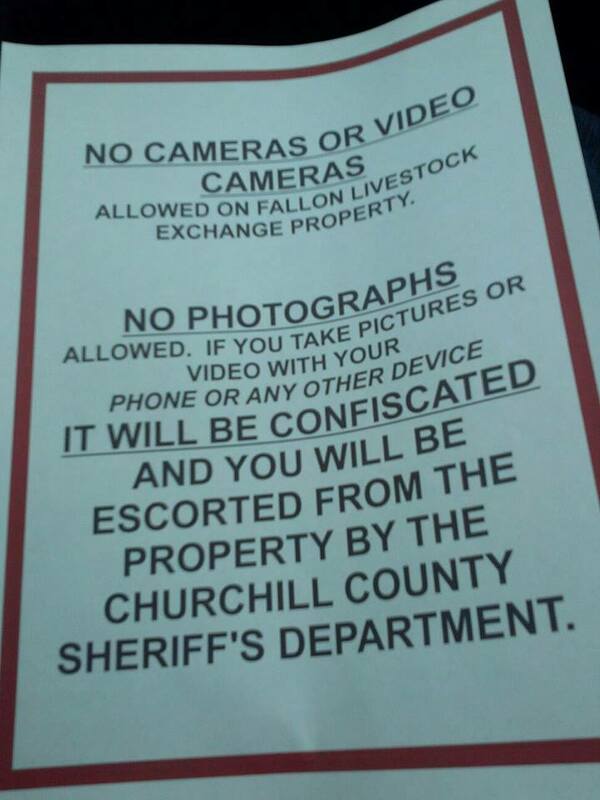 Below you can read my liveTweet coverage from Nevada's Fallon Livestock Exchange. If you need clarification of some of my funky abbreviations, just ask. Please forgive me misspellings and non-nimble fingers. I was trying to get the info out as soon as possible. As you may know, Twitter only allows 140 characters (letters, numbers and spaces) in each entry. This is what came before and during the auction. After the auction, hundreds of horses were saved. Hundreds went to slaughter. 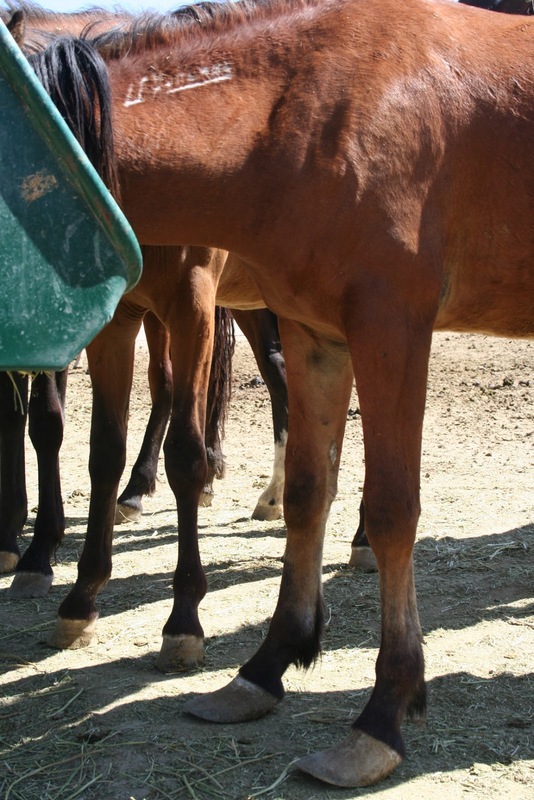 Tomorrow, we learn the future of the unbranded horses, as decided by a Federal judge. Owner #fallonslaughter auction says lawsuit cost #wildhorses homes, may truck them out of here 2 have" heads chopped off"
Finally walking thru pens. Every girls dream horses. I'm counting down the minutes. 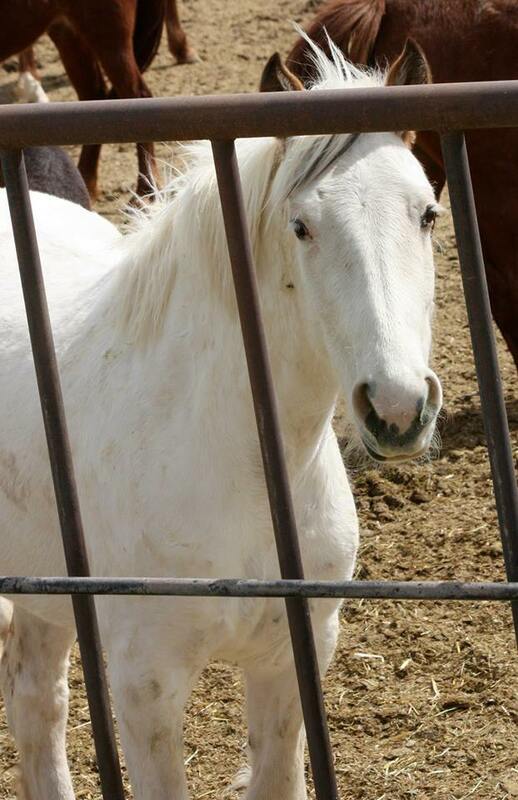 Federal Judge Miranda Du set a hearing by teleconference for 1:30 p.m. today to decide whether to grant a temporary restraining order suspending the auction of over 400 wild horses. 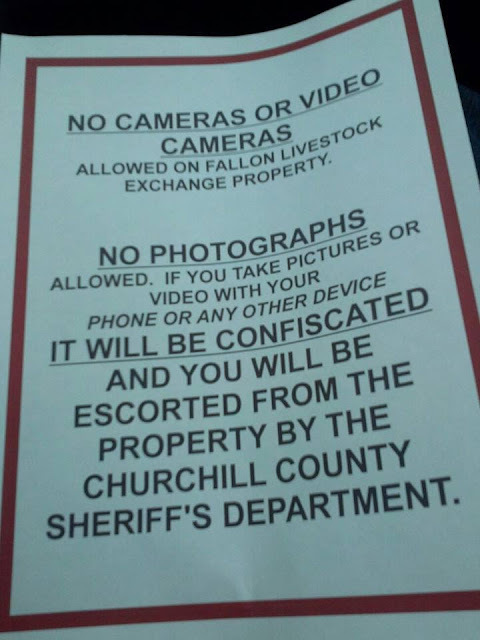 I don't want to return to the Fallon Livestock Exchange tomorrow. My heart hasn't mended from the first time. For years, I've known that wild horses and their tame cousins are sent to livestock auctions where they face "kill buyers." I wrote such an auction in GIFT HORSE. It was based on interviews and research. 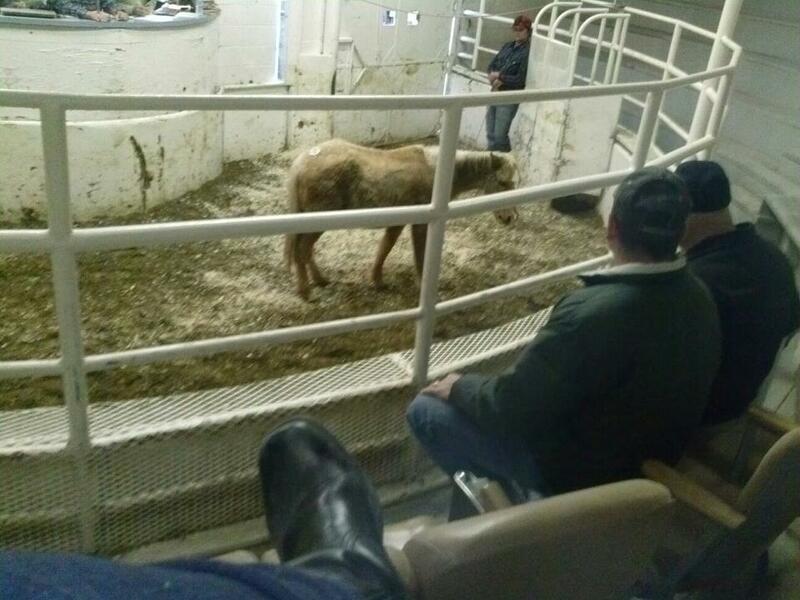 On January 9 of this year, I attended a slaughter auction. My heart falls heavy in my chest when I think about it and my throat aches like it's full of splinters when I try to talk about it. 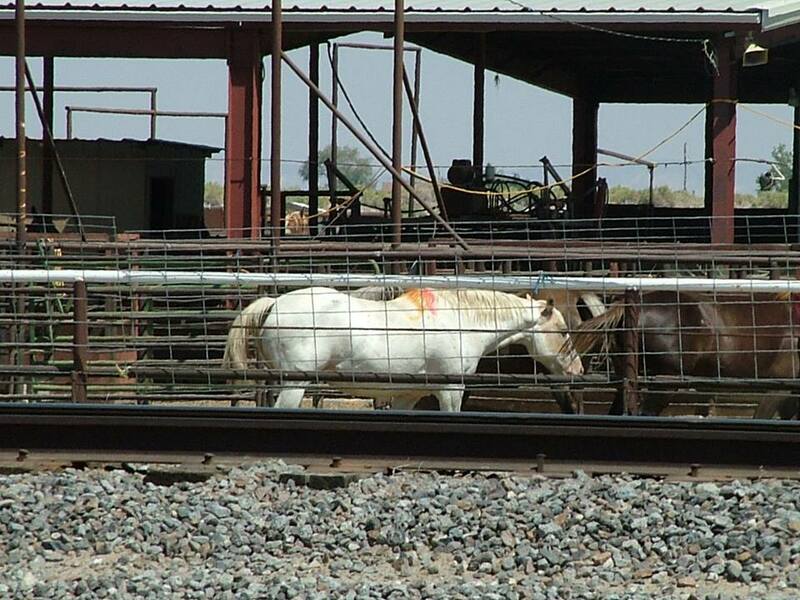 I went to this auction to find 41 wild horses which had been trapped by the Nevada Department of Agriculture. Members of the Hidden Valley Wild Horse Preservation Campaign hoped to use donations -- from people around the world! -- to buy back the wild ones. But the horses that I can't forget were domestic horses. Trailered for miles and then left in strange corrals, they neighed and whinnied after their owners. Before the auction Shannon Windle and I walked around looking for the mustangs, but the horses that came up to fences, puzzled and friendly, were cow ponies, race horses, a burned-out endurance horse and mounts that had helped children learn to ride. Herded down a chute and into the auction ring, many realized they were in danger. So, they did what they'd learned to do. They trotted up to the edge of the auction ring and nudged at boots of audience members. Those horses had been raised as pets or at least, trained to trust humans. They didn't know where they were. They didn't understand what was expected of them. They didn't know why they were in an unfamiliar place that smelled of fear. Ironically, they turned for help to the species that had betrayed them. I think the only thing that kept me using my head during that long, long day, was doing a series of live posts via Twitter, for horse lovers far away. I hope I don't ever have to do it again. 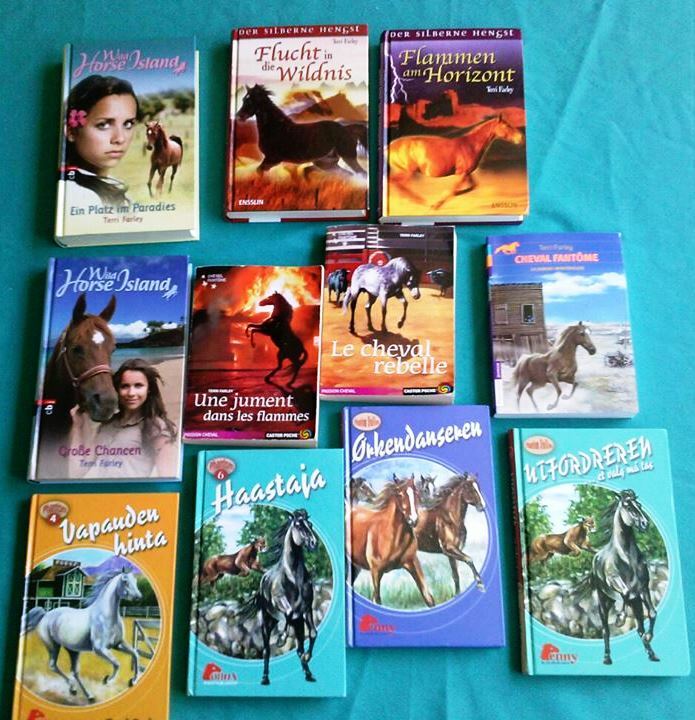 Multiple copies of the Phantom Stallion and Wild Horse Island foreign language editions pictured here are sitting, unloved, in boxes. free to good homes ! Education Tip: When I do school visits, I bring along American originals and foreign editions. Then, because cover art differs so from country to country, I ask students to compare/contrast cultural perceptions of today's American West. Even the little ones love looking for clues to make matches. Feel free to shoot me a personal email farleyterri@aol.com from your school or library email address if you’re interested. By Monika Courtney, Evergreen, Colo.
Was the quick organizing of a BLM workshop in Reno a courteous act or another PR stunt – pulling a hand brake on bad publicity pertaining to animal cruelty at Palomino Valley government holding facility? I fear it is the latter. The workshop’s structure defined biased control, a la Delphi style. Time restraints and biased input by “experts” recruited by BLM, rendering opinions rather than integral advice on current lack of shelter in higher climatic heat trends… reflected disregard for horses and us. Despite Joan Guilfoyle’s (Division Chief) welcome gospel of “engaging with public”, most left with a sense of non-accomplishment. You may see a shade going up over the sick pen, the sole objective of PhD, UC Davis recruits insisting on lack of shade studies on wild horses, therefore forfeiting the benefits thereof to the confined, suffering equines in their care. They even claimed shade increases insects, when the contrary is pointed out by reputable equine veterinarian experts. 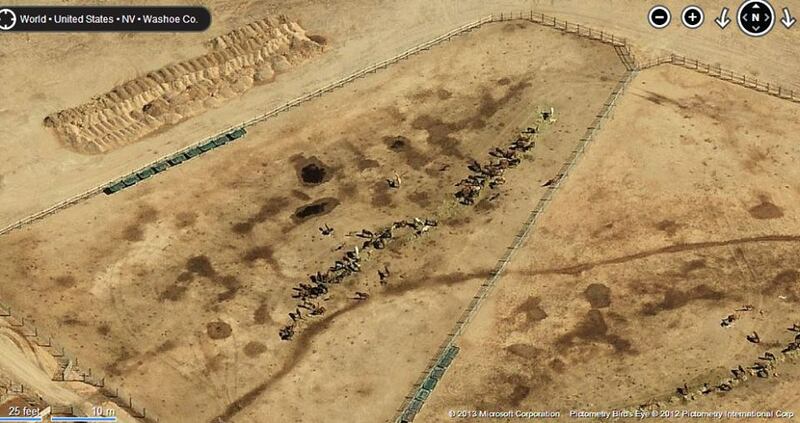 BLM's barren Palomino Valley Wild Horse Center as seen from the air. 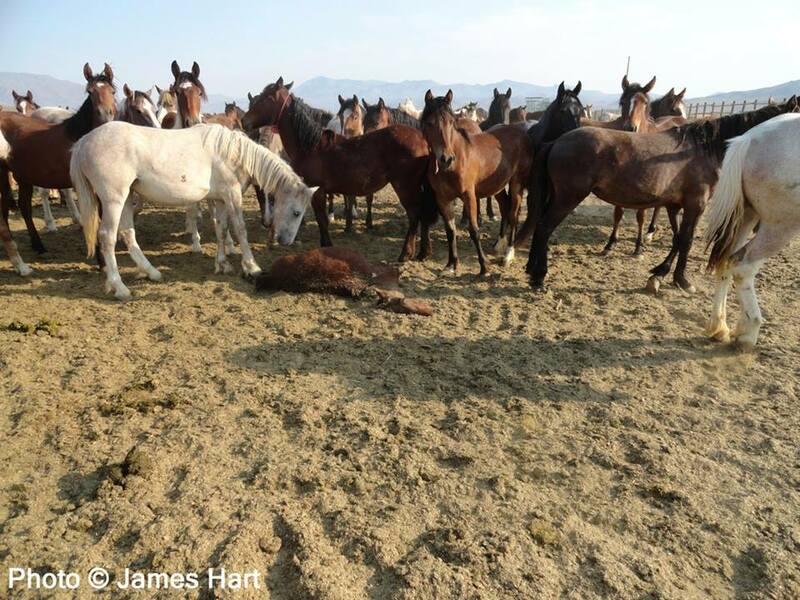 These vet recommendations, shelter/heat stress /nutritional info, NWS weather charts, photos of wild horses in shade on the range were submitted. Common sense of roof structures as they have over hay stacks but none for horses does not exist. It is dispelled with biased scholar magic geared to halt public pressure of increasingly concerned tax payers. Moreover, sequester excuses garnish the agenda. 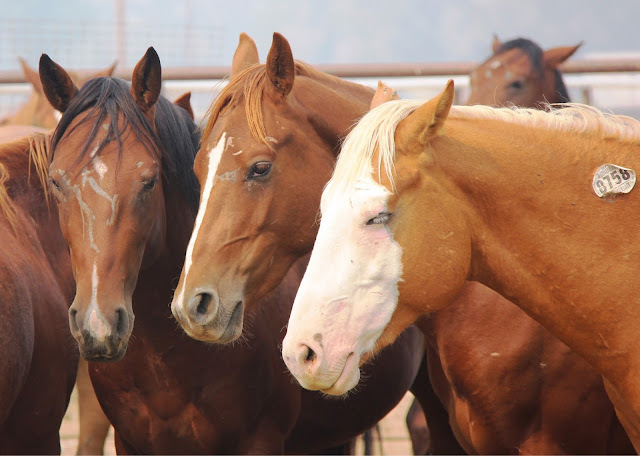 While monies are allocated to continued “emergency” round ups to stockpile more horses, non-existing “shade research on wild horses” is discussed to deter from the goal. The neglect is real. 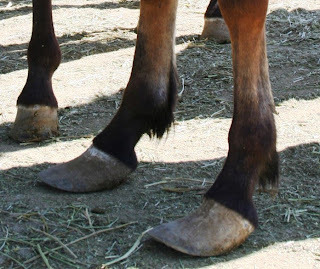 7 inch long curled duck feet hooves of limping horses in the “trim” pen (just when? ), foals baking, the suffering and inhumanity are a disturbing whopper to digest. Anyone in doubt, take a trip to PVC. The ghostly broken spirits trapped onto 160 acres of hell are prisoners of a self-serving agency, demonizing them since decades. With a self-inflicted crisis, the budget pie is off the rocker as tax funds go to round ups, holding, and administrative overhead. Little to none is given to welfare or more sensible on the range management. The one size fits all quick fix scriptures of BLM, evicting more horses as I type, causes unspeakable suffering. Yet, BLM creates horse mills resembling feedlots, with absence of modernity and wellbeing to animals, which would label any private person a sadist. The saddest chapter in this book of misery is that those in charge are outlandishly detached. Federal guidelines to holding do not currently exist– but agony and suffering. Policy handbooks with strict quality care to be implemented are needed now. Life on the range, as the 1971 Act intended, with mustangs’ contribution to the balance of the eco-system where they also help prevent wildfires, seems to be a science BLM is not willing to consider. Surely, life in the wild is more humane than the equine concentration camps and death pens. Thinking of the pleading horses I met at Palomino Valley… I think they would agree.